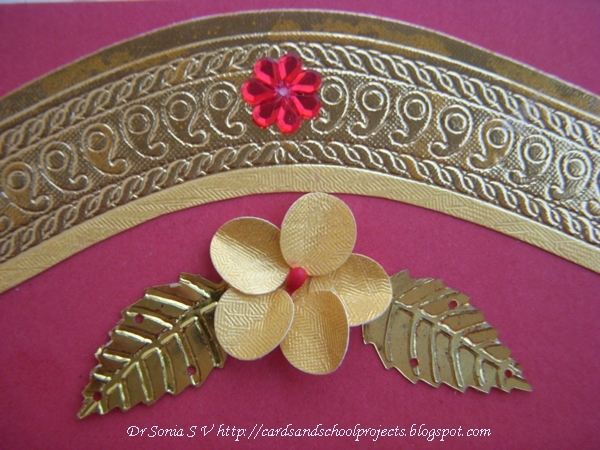 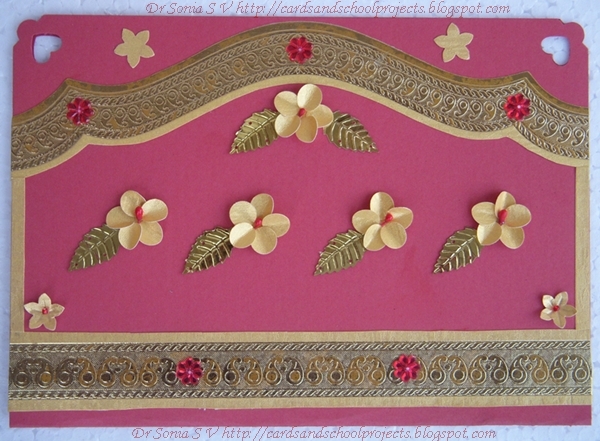 This card is a recycling project -the golden paper in this card has been cut out from a wedding invitation card which I recycled.The wedding invitation cards in India are so gorgeous . 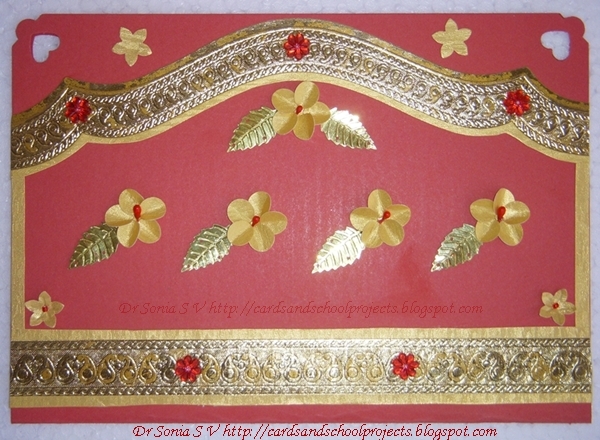 This card is inspired by the ICR 3 challenge photo inspiration - I have used the rich golden color and the perfectly Indian design on the golden paper to depict the theme. 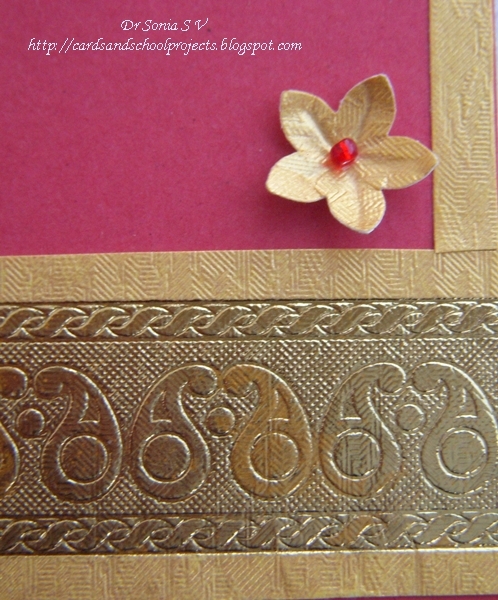 Gently fold the circles .You can emboss too but folding gives as good a result and saves a lot of time! Layer the circular flower petals overlapping each other. Embellish the center of your flower : If you are using beads or pearls avoid the flat base ones as the center of your flower is not flat. 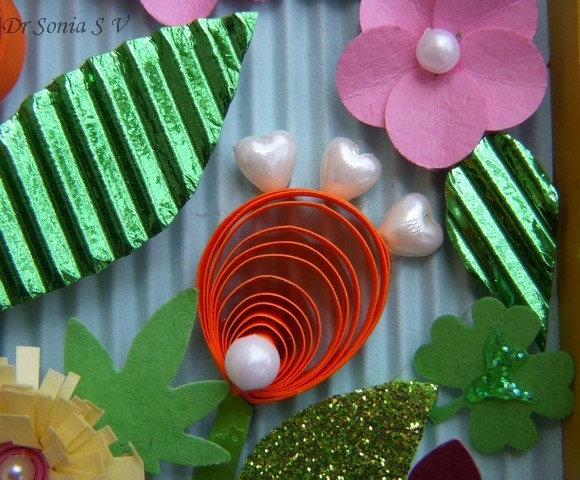 Embellishing using flower stamens/pistils:Cut close to the bulbous portion and glue to the center of the flower.You can hide the narrow end within the flower petals so that the center seems to emerge from deep in the flower. 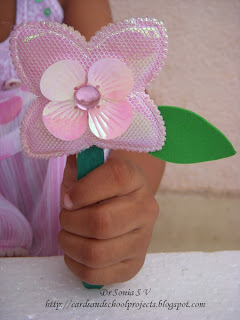 If you have a flower punch - try this technique- It makes your flowers come alive! 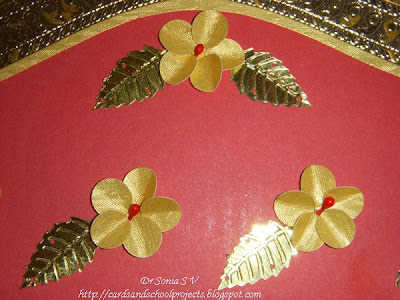 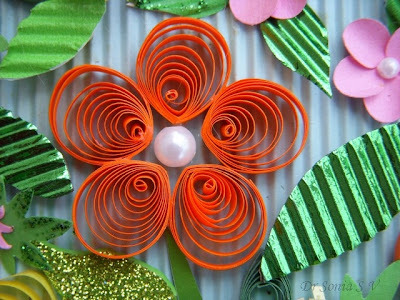 Use a blunt tooth pick / inkless ballpoint pen or embossing tool to run from the center to the tip of the flower petals. 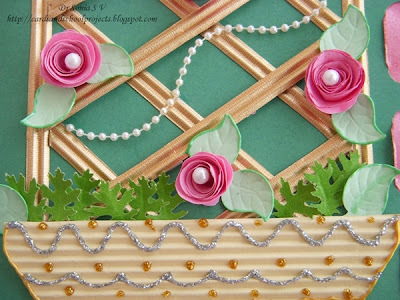 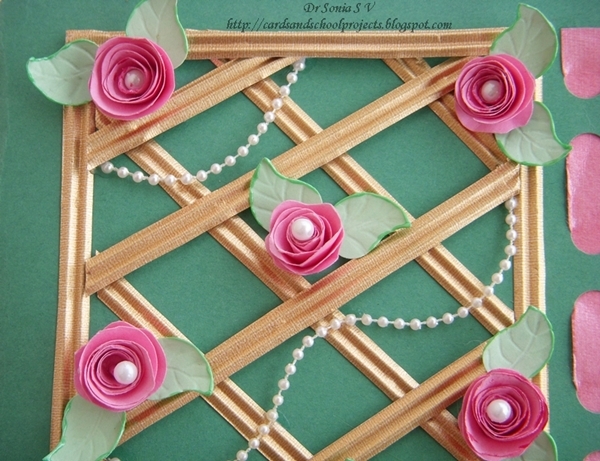 This card has lots of spiral Roses on a lattice work .Here are some Photos of the making of this card. You can find card templates at unusual places just be on the look out! 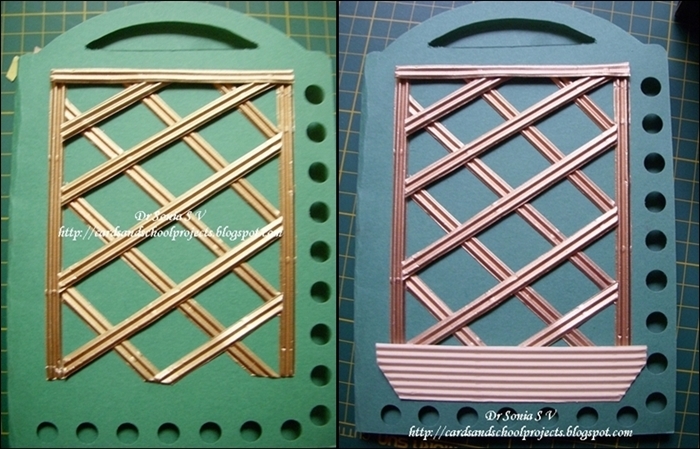 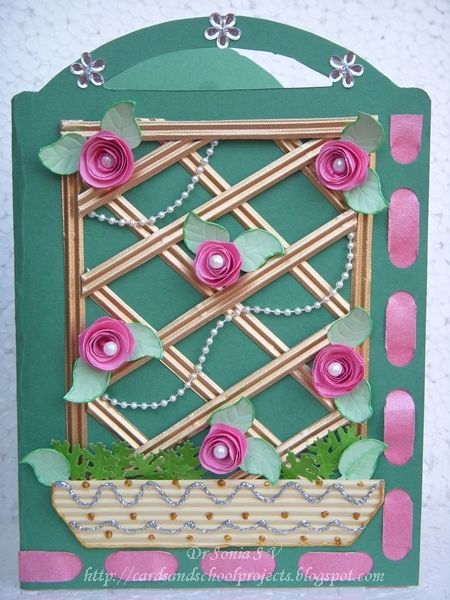 Here I have used my chopping board to make the template for this Archway shaped card. 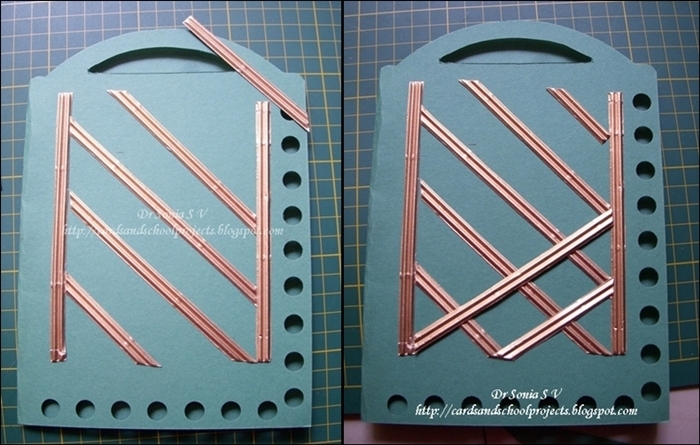 The holes are for insertion of the ribbon.Corrugated paper strips are stuck on the card as shown.I have used double sided foam sticky tape for the second layer of bars to give the added 3 D effect. 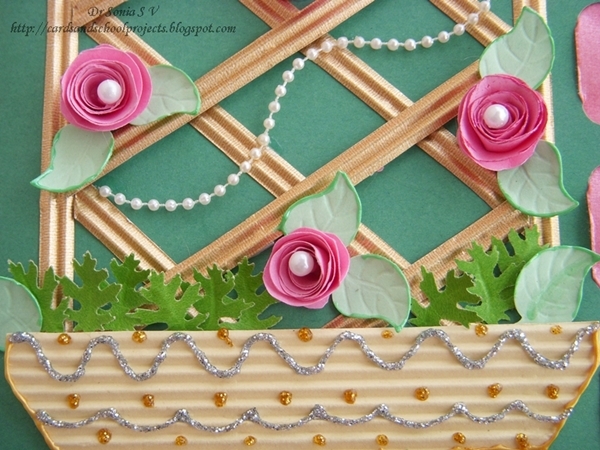 Glue in Spiral roses and the pearls and pearl garland.The pink ribbon like border is actually a paper strip- I didn't have the right ribbon to match the flowers so I used a matching paper strip. 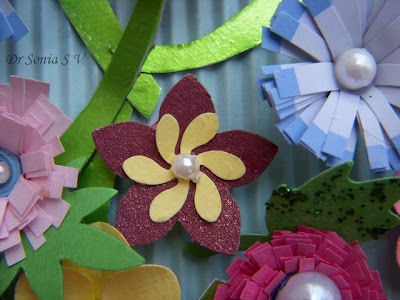 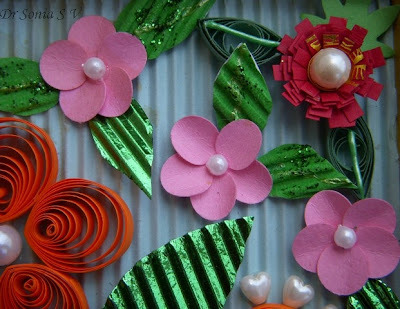 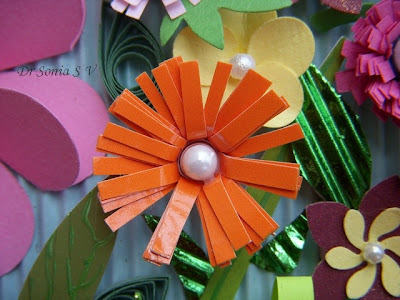 Here is the link to make the Honey comb Flower Pop Up Card Tutorial. 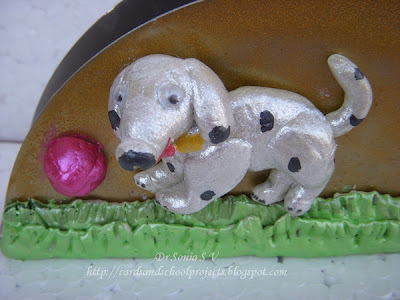 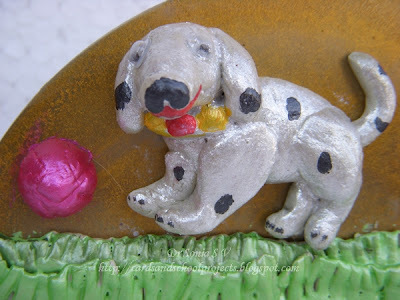 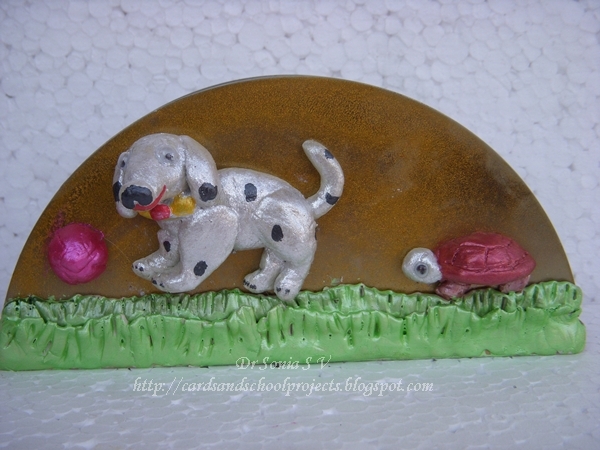 This is another Mseal Art Project.The puppy was easy to make and was inspired by our cocker spaniel hence the long ears but my daughter wanted him to be a Dalmatian so the spots! 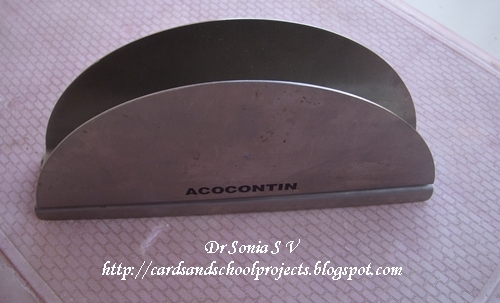 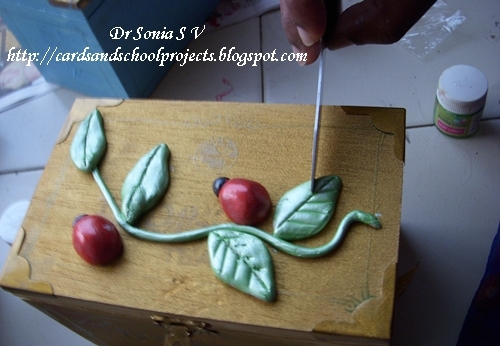 This is the tissue holder which we altered for this project. 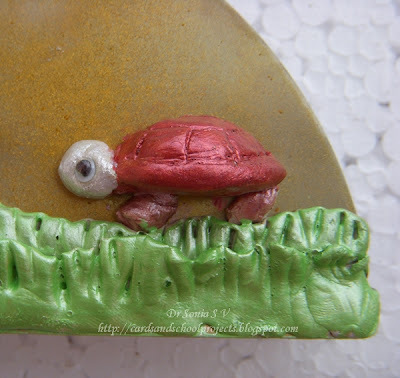 The tortoise shell and head are just 2 squashed ball .The feet are small cylinders.The shell was marked out with a kitchen knife.My little one put in a googly eye for the tortoise's eyes. 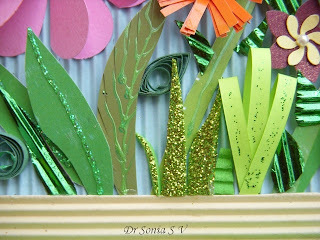 For the grass I layered 2 sheets of Mseal and made indentations with a kitchen knife and then painted with Pearl green. 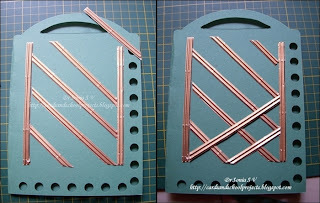 Check out the Mseal Art Tutorial in the earlier post. 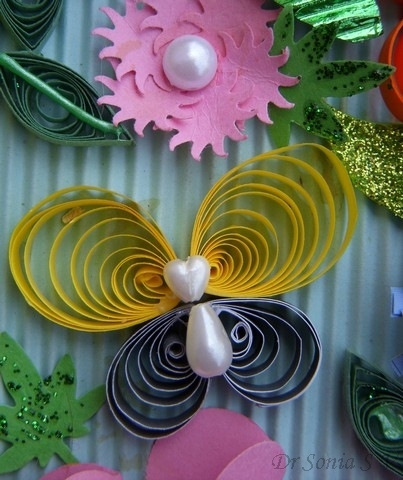 Do try out fun projects with Mseal and do leave me a link to any project you have done or do. 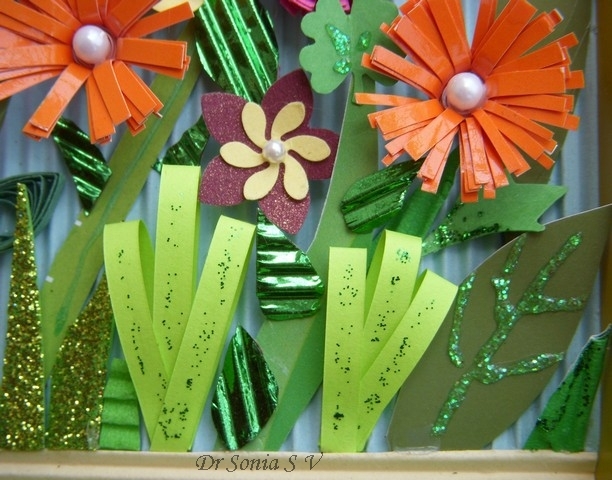 Mseal Art is fun ,inexpensive and super easy. 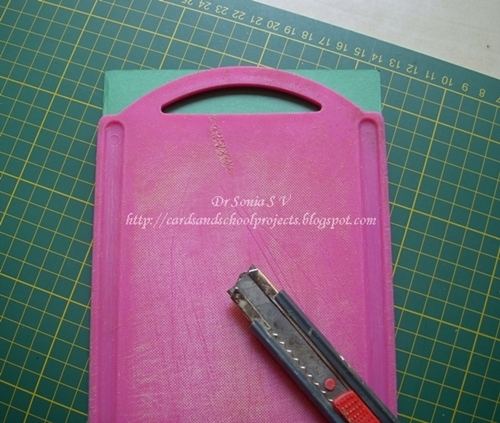 When I started with Mseal art I knew nothing about it .It was an impulse buy from a stationery shop!I read the instructions on the packet to get started and learnt by trial and error.I am posting this tutorial to help anyone like me who likes to experiment with new crafts. 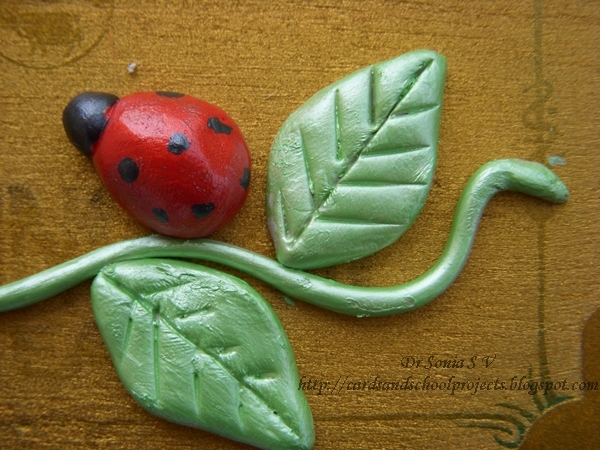 Mseal is epoxy resin.It is actually a substance used by plumbers to seal leaks! 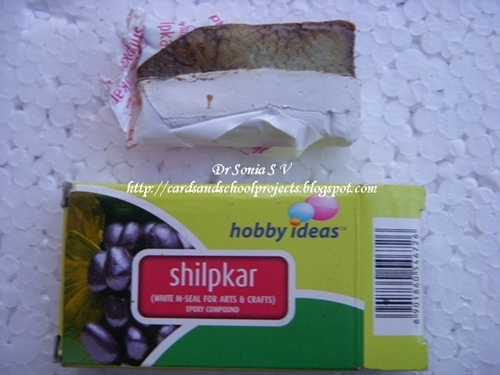 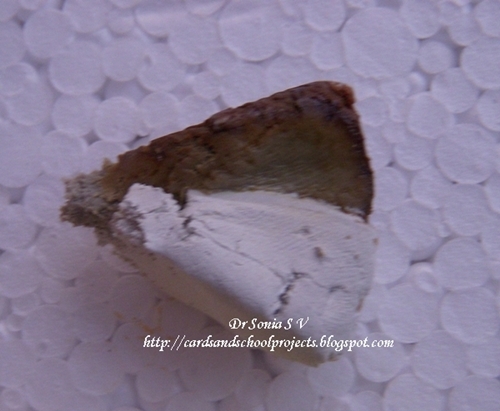 Its manufactured as white mseal for hobby crafts.It is not expensive and the standard packet 50g packet costs just rupees 15. 1.On opening the packet you will find 2 substances. 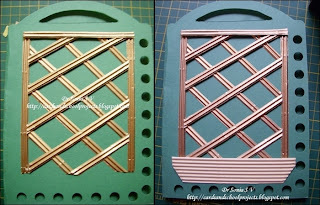 2.Pinch or cut out some as shown below.If your Mseal is a little old there might be a hard layer at the junction of the 2 colors- remove this hard strip as I have found that this strip of Mseal remains hard and can interfere with the texture of your finished work. 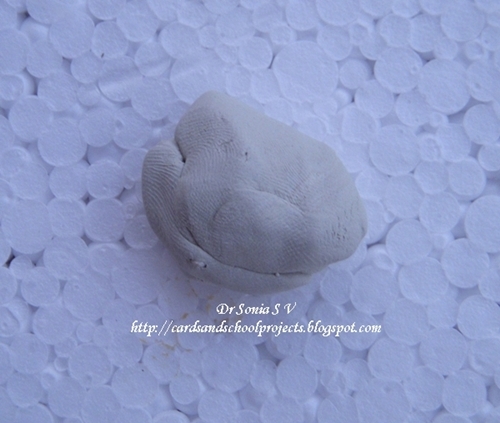 4.Once the 2 parts of the Mseal are thoroughly mixed it changes color to white and becomes soft and pliable.You are ready to sculpt now.It hardens in 60-90 minutes so plan your project accordingly. 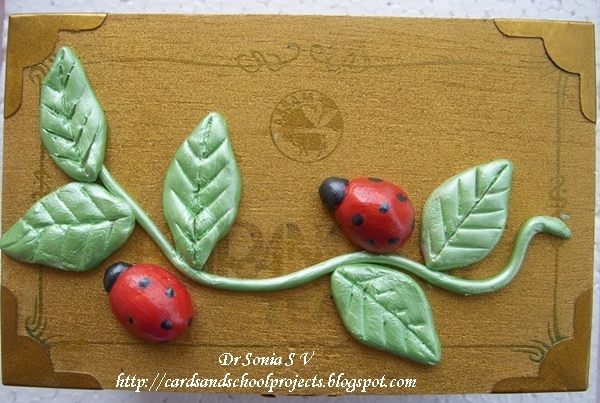 Roll a long strip for the stem and small balls for the lady birds. Make veins for the leaves with a regular kitchen knife. 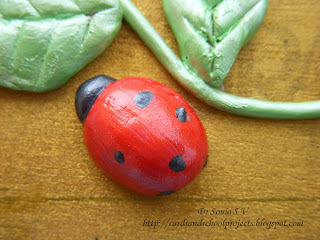 Paint the lady bird body red and head black. Once the red paint dries paint spots with black paint. Mseal art is fun and easy. Oh and unlike salt dough craft you don't have to varnish it. 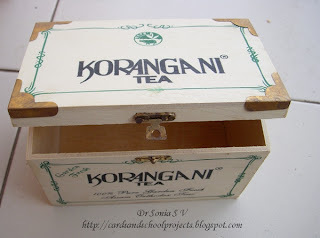 It stays the same for a long long time. Its a pretty simple craft but lets make it simpler with instruction! 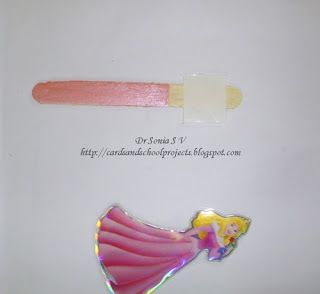 1.Choose how much of the candy stick you want the sticker to cover.When working with little ones its nice to mark and tell them to paint below that line. 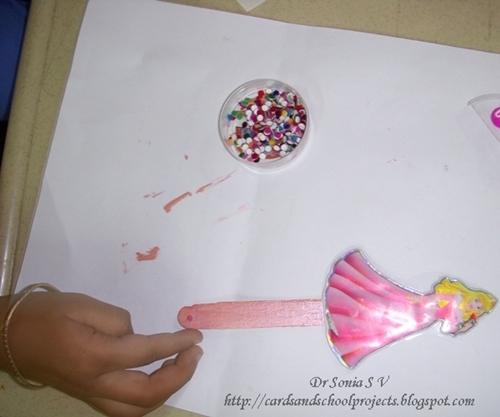 2.Paint the stick.The color in favor at home right now is pink so here is my little one painting her candy stick pink for the pink princess sticker. 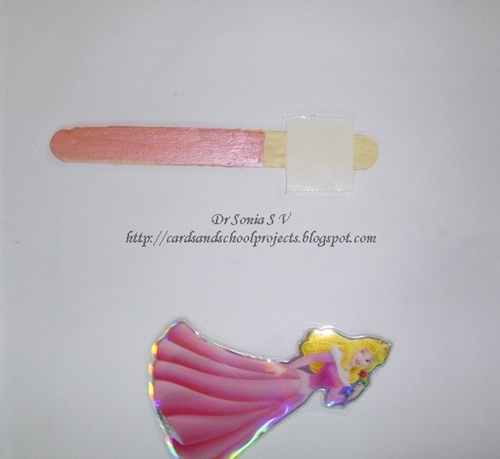 3.Stick the sticker on stiff card to give it some strength and cut it out.If you are using puffy stickers like we did here keep them on the original sheet and cut out.Glue the sticker on the stick with white glue,sticky tape or glue drops.Whenever I craft with my little one I find glue drops invaluable. 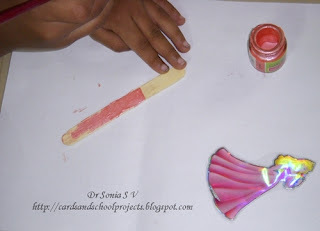 They are fast and non messy. 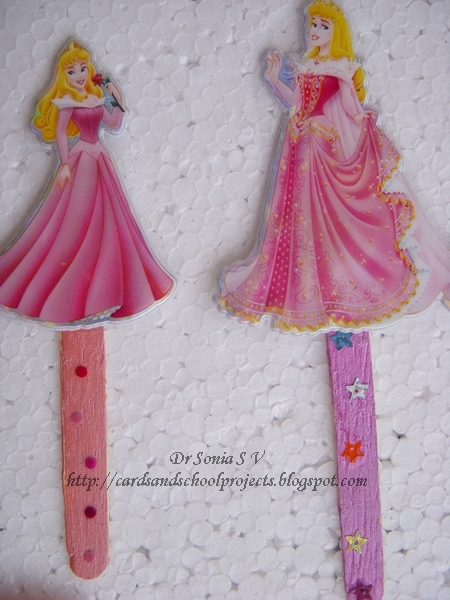 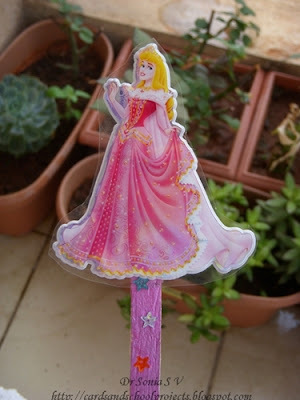 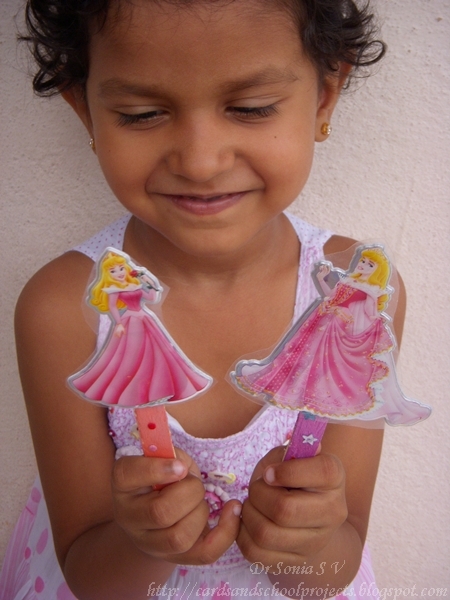 4.Embellish your puppet.Here my little one is using small "bindhis "[ a popular fashion accessory for Indian women].The princess below has stars on her Ice cream stick. We had a lovely wooden box which my daughter and I painted and did some shell craft.We made a Pair of Koalas sitting on branches! 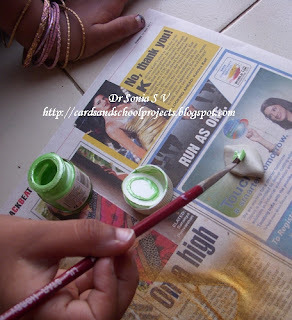 Paint-optional. 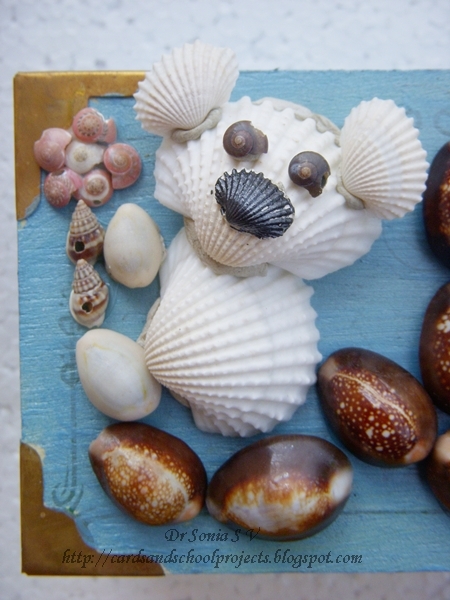 I love the natural beauty of the shells and used only a teeny bit on the nose of the Koalas.The pink flowers in the Koala Bears hands is natural shell! 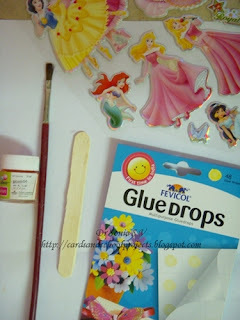 Think of a design and start gluing! 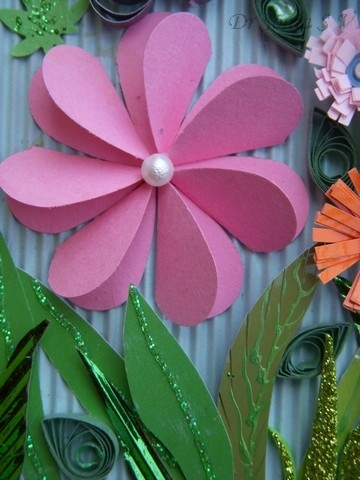 Work from the center outwards. 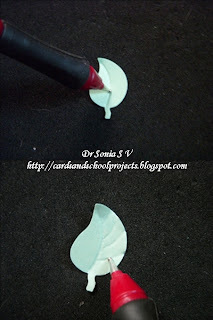 White PVA glue is enough to stick the shells but if you want to really defy gravity as we did for the Koala's ears and you are using white glue you need to hold the pieces in place for quite a few minutes. My daughter is fairly patient but if she is really fond of the work we are doing, she will keep on asking " Is it dry yet?" 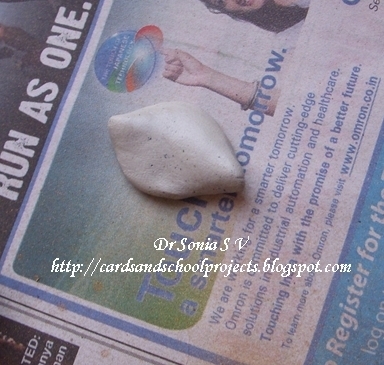 So we used Mseal for the ears.Mseal is quick and strong and super easy. 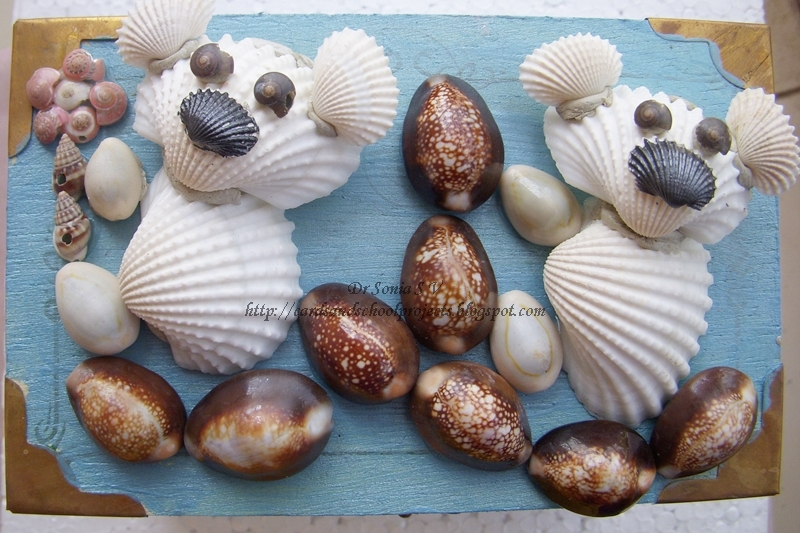 The shells are from Kochi which is a seaport in Kerala [A Southern State in India] my homeland .They were sent to my daughter from my father, her grandfather with loads of love! 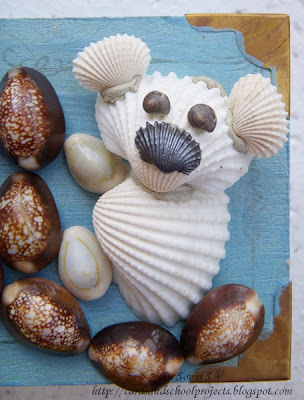 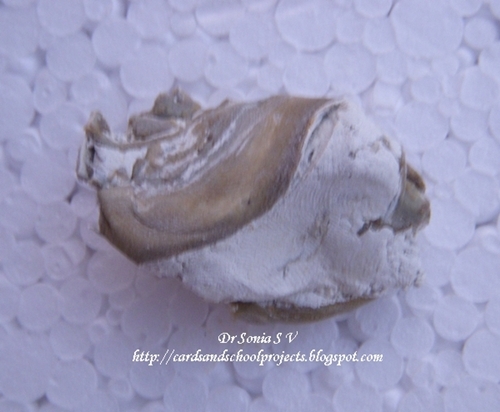 Shell Craft I have found is great fun to do with kids! 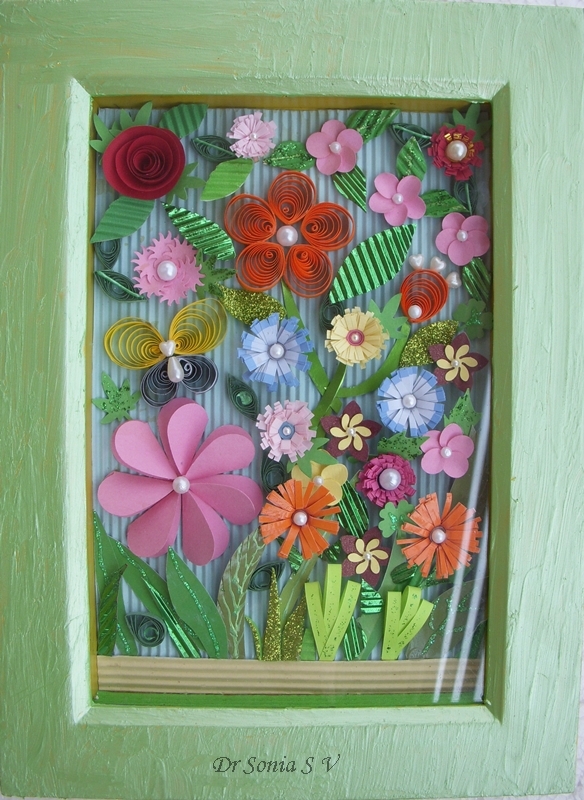 This is my first major quilling work.It is a recycling work as the quilling is done on a clock which had broken down . 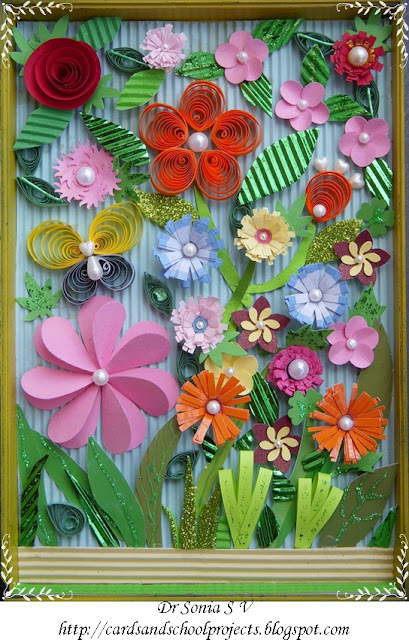 I removed the clockwork mechanism and lined the inside with blue corrugated paper for the background.The major part of the paper used is recycled from magazine covers, medication pamphlets, old wedding cards etc. I am just learning to make eccentric coils and this is a sort of maiden attempt at an eccentric coil flower.The orange paper was hand cut from a medication pamphlet. 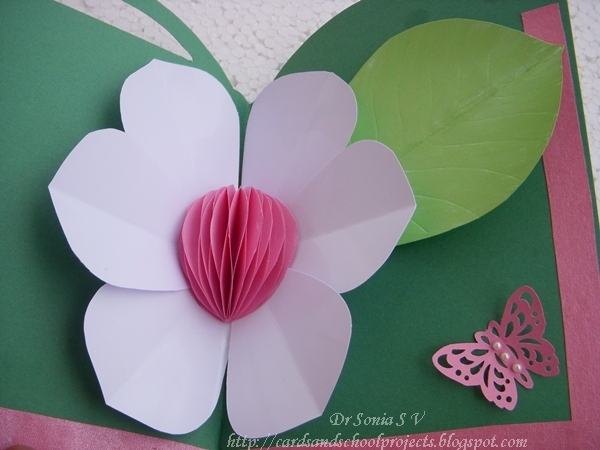 One of my favorite heart punch flowers.Check out the tutorial how to make the heart punch flat folding flower. The pink flower is made out of multiple sun punched tiny suns.The quilled butterfly is adorned with a favorite heart shaped pearl which I got from a local shop. These pink flowers are a personal favorite.They are made out of 5 circles overlapped and glued on a small paper base. The punch craft flower has been punched out from a wedding card.I always keep wedding cards to recycle. 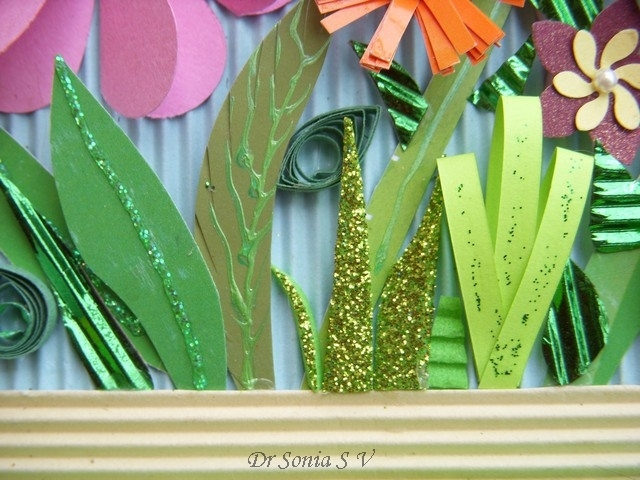 Different shades of greenery all from recycled cards,magazine covers ,packages what not!I have inserted the leaves and stems into the cream colored corrugated paper at the base. 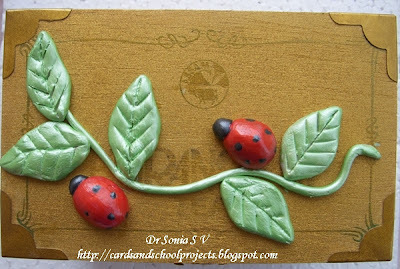 This project is the first major quilling work I have done. 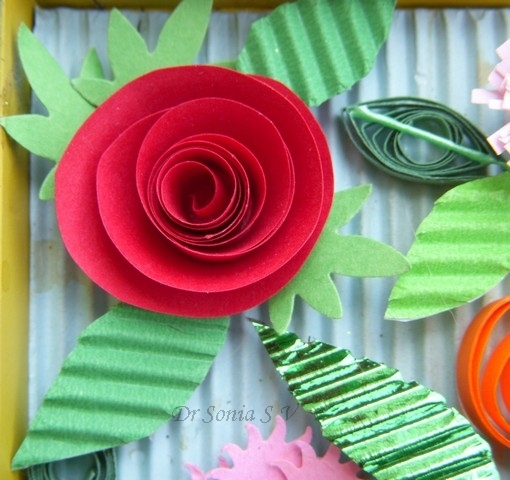 Do post your comments would love to hear from you.